The Ruby 6L6GC-MSTR is from the Shuguang factory. It's thicker glass envelope and sturdy construction is designed to work in the most demanding applications. They are packed with lot's of punch and a sweet sweet tone, very musical. Philips STR-415 copy. This is the same tube Mesa relabel's as their STR-440's. Shipping was fast and packaged very well. I really hate to admit that you don't have to spend the most to get the best bulbs.....and I've been through a LOT. These chinese tubes always sound clear and punchy in my amps and last and last. 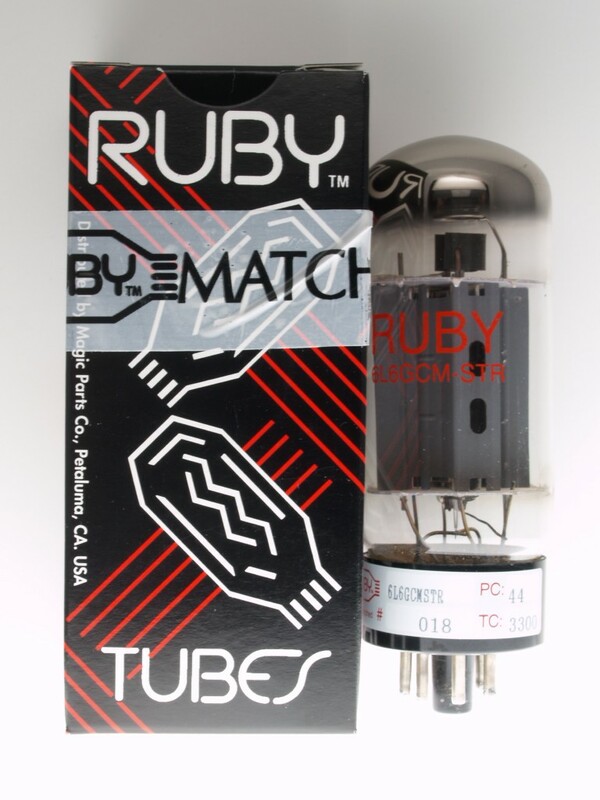 Just wanted to let you know I got the tubes I ordered from you today. I popped them in and they sound completely amazing. It's tight, articulate and awesome. I want to thank you for the excellent recommendation on replacement 6L6 tubes for the 40 watt Egnater. The Ruby 6L6GCMSTRs sound perfect. The two tubes were very closely matched and the resulting sound is really excellent. The packing for shipment was solid and the box arrived quickly. Can't ask for more! Played the amp last night for several hours after changing the tubes. I just wanted to thank you for putting together a great tube swap for a great amplifier. My Mesa Roadster sounds fantastic! It is very quite and has a very pure tone. I was able to really dial back on the gain and get some amazing tones with less noise. I'll be honest, I was a little hesitant to order non-Mesa tubes, but I'm glad I did! The reviews on forums and on your website can be believed and I'll order from you in the future. Thanks! Got em! Love em! I can't wait to play out with my 'new' amp! I just installed the Rubies you sent me for my Fender Twin, just wanted to say thanks for the help is the best I have heard this amp sound since I owned it, is there a place to give a review to spread the word of your help and your products? Just retubed my amplifier and first impressions it sounds fantastic, a bit more tweaking and I`ll have it sounding amazing. Recently fitted the preamp tone pack (6) coupled with the power tubes this amp now sounds excellent. Great gain tone, notees are clearly defined and with a wall of sound behind you, the leads are amazing singing. Anybody reading this and are unsure about purchasing these tube kits, rest assured you`ll be amazed whatever style of music you play, I mainly play rock/metal so went with the recommended descriptions. RUBY 6L6GCMSTR's and for the 12AX7's, a Tung-Sol in V1, a Sovtek LPS in the phase inverter and Ruby 7025SS's. The tubes got here today, and I cant believe the difference!!!! Thank you so much!!!! The tubes sound beautiful, pretty much exactly what I was looking for. For the money, with a small investment in tubes, I am very pleased with it. Also very pleased with your service and will recommend you to anyone I know needing tubes. Thanks again!